On this day in 1837, the Congress of the Republic of Texas granted a charter to the citizens of Independence, Washington County, for the establishment of a nonsectarian, nonpolitical "seminary." The charter was a response to a petition presented a month before by John P. Coles, a large landowner and Old Three Hundred settler who had founded Coles' Settlement, later Independence. In order to carry out the charter, the young Henry F. Gillette bought an existing girls' school from Frances Thompson. Hugh Wilson, a Presbyterian minister, taught at the new academy. In 1839 the institution, known as Independence Female Academy, enrolled more than fifty students taught by a Miss McGuffin. In 1841 Edward Fontaine, a Methodist minister who later became an Episcopalian minister of considerable importance in Austin, taught at the school. Independence Academy closed in 1845. Its property was purchased and donated to the newly chartered Baylor University. Not until the Constitution of 1845 were the requirements for a system of public education legally and thoroughly specified. On this day in 1856, Memucan Hunt died at his brother's home in Tennessee. He had come to Texas just after the battle of San Jacinto. President Houston appointed him agent to the United States to assist William H. Wharton in securing recognition of the Republic of Texas. That task successfully accomplished in March 1837, Hunt became Texan minister at Washington. Although his proposal of annexation was rejected by the United States (1837), he succeeded in negotiating a boundary agreement in 1838. Hunt served under President Burnet as secretary of the Texas Navy. In 1841 he ran unsuccessfully for vice-president. 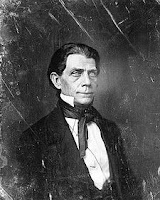 Hunt served briefly in the Mexican War and after annexation served one term in the Texas legislature. Hunt County is named in his honor. On this day in 1880, Myra Maybelle (Belle) Shirley Reed, the "Bandit Queen," married her second, or possibly third, husband, Sam Starr, in the Cherokee Nation. Belle Starr was born near Carthage, Missouri, in 1848. During the Civil War her family supported Confederate irregulars such as the raider William Clarke Quantrill. By 1864, after Carthage was burned, the family had migrated to Scyene, Texas, near Dallas. There, in July 1866 Cole, Jim, Bob, and John Younger and Jesse James, Missouri outlaws who had ridden with Quantrill, used the Shirley home as a hideout. Her first husband, Jim Reed, became involved with the Younger, James, and Starr gangs, which killed and looted throughout Texas, Arkansas, and the Indian Territory. After Jim Reed was killed by a deputy sheriff at Paris, Texas, in 1874, Belle may have married Bruce Younger. If that relationship existed, it soured before she married Sam Starr. Belle and Sam Starr were later charged with horse stealing, and she received two six-month prison terms. In 1886 she was acquitted of yet another charge of horse theft, but in the meantime her husband and an Indian policeman had shot each other to death. Belle Starr subsequently took several lovers, including Jim July (or Jim Starr), Blue Duck, Jack Spaniard, and Jim French. In 1889, while Starr was living in the Choctaw Nation, near the Canadian River, an unknown assassin killed her from ambush with a shotgun.